Following a rousing debate, Chicago's City Council approved a watered-down ordinance Wednesday to regulate the rideshare industry in the city. Drivers for Uber and Lyft will now be required to to get a transportation network driver license, in order to even the playing field with the taxi industry. Companies will also be required to continue administering criminal background checks and drivers will need to receive training developed by the rideshare industry, either in person or online. Uber lauded the measure's passage Wednesday, praising Mayor Rahm Emanuel, who championed the measure earlier this week and called it a "compromise." "Over the past several months, hundreds of thousands of Chicagoans urged the City Council to protect ridesharing in their neighborhoods," Uber said in a statement. 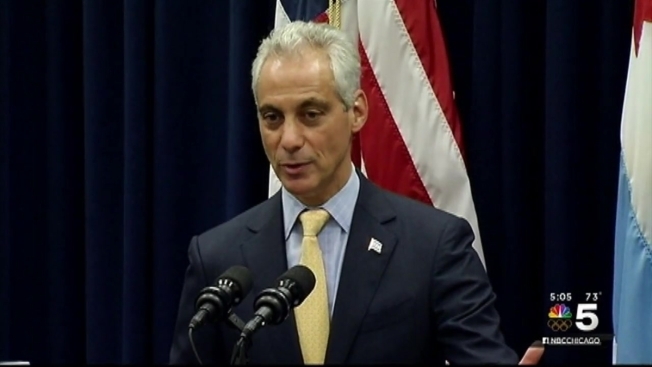 "Thanks to Mayor Emanuel's leadership and good faith by many aldermen, their voices were heard today. While not perfect, we believe the compromise will preserve ridesharing and ensure drivers can continue to serve every neighborhood in Chicago." Wednesday's meeting started with some political gamesmanship. Ald. Scott Waguespack tried to delay the vote, at which point Emanuel moved to end the meeting and call aldermen back to session on Friday. Waguespack ultimately withdrew his motion, noting that the vote was going to pass regardless. Transportation Committee Chair Ald. Anthony Beale warned against inaction on the measure Wednesday. “We don’t want to turn into Springfield or D.C. where they do nothing,” Beale said. Beale backed off a more constricting plan after facing pressure from Mayor Rahm Emanuel, who sided with the rideshare companies. The issue of fingerprinting, a major point of contention for Uber and Lyft, was also tabled for the time being. Instead, a six-month study on fingerprinting drivers for background checks for rideshare companies was approved Wednesday. Rideshare companies will also be given an additional six months to devise a plan for expanding accessibility for the disabled. Also gone are drug tests and physical exams for drivers, which were part of the previous plan. Last week, Uber and Lyft threatened to leave Chicago after the more restrictive rideshare ordinance was unanimously approved by a joint City Council committee. Ald. Walter Burnett warned that City Council was finding itself “more and more in the middle of corporations” Wednesday. Unsurprisingly, the union representing taxi drivers was not pleased by the ordinance’s passage and the less stringent regulations. “While Mayor Emanuel and other supporters of the substitute ‘Rideshare Reform Ordinance’ proclaim it to be a compromise made with coalition partners, nothing could be further from the truth,” a spokesman for Cab Drivers United/AFSCME Local 2500 said in a statement. “The core principles we sought in the original ordinance were access, fair rules, and safety, all of which have been discarded completely.